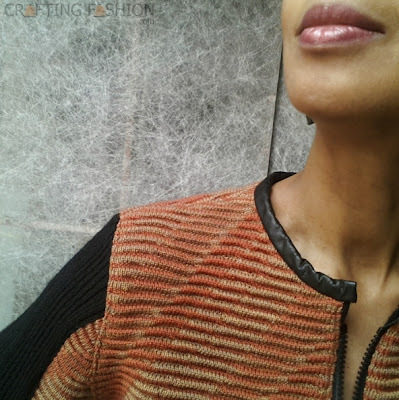 Last week's post on the Zipper Ripple Jacket was mostly pictures. There were a few challenges making the jacket, however. I documented one of them, Inserting a Separating Zipper in Thick Squishy Sweater Knit, before I actually finished the project. Below are a couple other special "situations" that came up that I'm making note of for future reference. No more "now how did I do that last time?" Seams Open or to One Side? Generally, when fabric is as thick as this fabric is, it's best to press or steam seam allowances open after sewing the seam. This rippled double jacquard was much too springy to stay open or to one side. The thick fabric is full of air and squishes quite easily under a presser foot. The serger's overlock stitch compressed the edges. I then used top stitching to hold the seam allowances to one side. You can see the top stitching on the bodice around the armhole. It's less visible on the sleeve where the black panel connects to the main fabric. 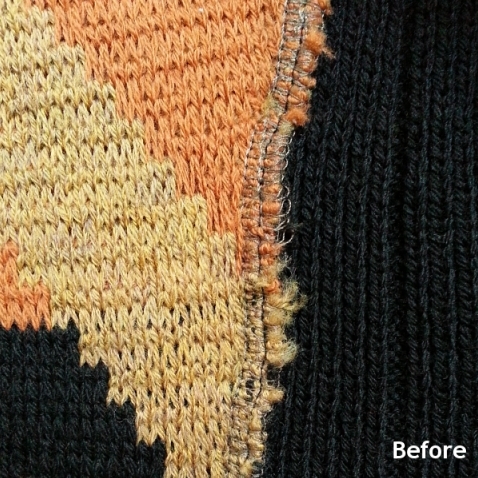 A simple serged seam (or serged seam with top stitching) is fine for a pullover. No one sees the inside. But since I'll actually remove my jacket on occasion, the inside could become quite public, and I'd like it to look nice. If I'd been thinking ahead a little more, I probably would have bound the seams before top stitching. Either one of these finishing techniques would have worked. I'll definitely use one of them next time. Since I've already top stitched, it's too late for any seam binding method now, so this time I'm covering the seams with a thin rayon (factory knit) jersey fabric cut into strips. You can see in this closeup that the seams get a little fuzzy and messy after washing. I pressed the edges of the rayon jersey strip under and used a slipstitch to hold the it in place over the seam. Each project is a very real learning experience for me. I think that's what keeps the cutting and sewing challenging and fun! i just have to tell you i devoured about eighty of your posts last monday in an airport.... 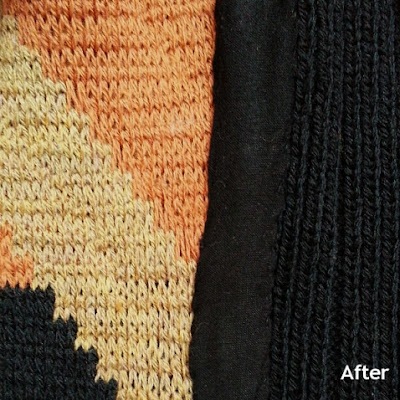 SO much awesomeness of sweater knit sewing school!!!! your jacket is scrumptious, every bit of it.